Eastman Lake is a reservoir managed by the United States Arms Corps of Engineers, located in the foothills in Madera County. 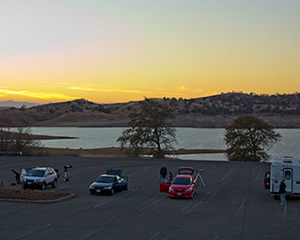 We use the parking lot next to the Cordoniz Boat Ramp as our observing site. From Fresno, take Highway 99 to the Cleveland Avenue exit in Madera, and turn right. At the intersection, follow the road as it makes a slight left and turns into Country Club Drive (and then Road 26). Go approximately 10 miles and turn right onto Avenue 26. After three miles it dead-ends; turn left onto Road 29. Follow Road 29 until it dead-ends in a large parking lot with a restroom structure. From the Yosemite Lakes or Oakhurst area, use Road 400 or Road 600 to make your way to Road 603. Follow Road 603 until it dead-ends, and make a right turn onto Road 29. Follow Road 29 until it dead-ends in a large parking lot with a restroom structure.